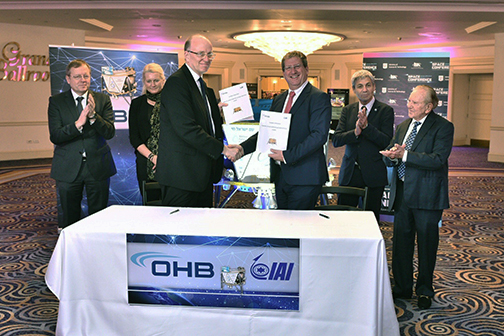 OHB System AG and Israel Aerospace Industries (IAI) have signed a teaming agreement at the Ilan Ramon Space Conference. Under the agreement, the companies will offer a commercial Lunar Surface Access Service (LSAS) for payloads up to 150 kg. to the European Space Agency (ESA). The TA was signed by Marco Fuchs, CEO of OHB SE and OHB System AG, and Opher Doron, GM of IAI’s Space Division. The signing ceremony was attended by Johann-Dietrich Wörner, Director General of ESA, Prof. Pascale Ehrenfreund, chair of the Executive Board of the German Space Agency DLR and Avi Blasberger, director general of the Israel Space Agency. Under the agreement between the companies, OHB System AG will act as prime contractor and will manage the work with ESA and the developers of scientific payloads for the lunar lander. IAI, for its part, will provide a version of their lunar lander, which was co-developed and built for SpaceIL; flight-ready and preparing to launch next month from the U.S.
OHB will manage the service commercialization and mission definition with prospective users; and manage the project and mission from payload choice and integration to launch and mission operations. As an outlook also a support on the lunar lander is envisaged. IAI will build the lander, accommodate payloads, integrate with launcher, support the LEOP and decommissioning and provide technical support in all mission phases from design, payload integration, launch and mission operations. ESA’s ISRU initiative — In-Situ Resource Utilization — will involve landing landers on the moon to test technologies for producing oxygen, water and other raw materials from lunar soil as well as collect and analyze samples of the moon’s earth. These technologies are needed for long-term human colonization outside Planet Earth. Marco Fuchs, CEO of OHB SE and OHB System AG, said exploring the moon and using it as a base is a logical next step that offers many advantages and opportunities. Landing on the surface of the moon, however, is still a challenge. At OHB, the company has carried out several technology studies on landing, using Moon resources, e.g., for fuel, oxygen or water production, and on robotics. The company also has a vast amount of experience in managing and accommodating very diverse payloads on spacecraft. Nimrod Sheffer, IAI CEO and President , added that IAI is proud to collaborate with a global satellite leader as well as with Europe’s and Germany’s space agencies. This is a badge of honor for the Israeli space industry. The technological know-how acquired in the development and manufacturing of “Beresheet” lunar lander with SpaceIL and the teaming with OHB allow the firm to partake in the advanced global research of outer space. Prof. Pascale Ehrenfreund, chair of the Executive Board of the German Space Agency DLR, noted that the German Aerospace Center appreciates the OHB IAI cooperation in the endeavor for lunar missions. Avi Blasberger, director of Israel Space Agency, commented that the company welcomes agreements that promote the Israeli space industry. The Israeli Lander to the moon has significant commercial potential. There's no time like the present, because... the premier smallsat networking event — the SmallSat Symposium — is less than one week away from presenting the most valuable business information for the smallsat and related industries at the Computer History Museum in Silicon Valley. Additional information regarding the SmallSat Symposium is readily available at this direct infolink... and register today to attend this major, smallsat, business event.